The voltage in India is 220 volts, alternating at 50 cycles (Hertz) per second. This is the same as, or similar to, most countries in the world including Australia, Europe and the UK. However, it's different to the 110-120 volt electricity with 60 cycles per second that's used in the United States for small appliances. What does this mean for visitors to India? If you wish to use an electronic appliance or device from the United States, or any country with 110-120 volt electricity, you'll need a voltage converter and plug adapter if your appliance does not have dual voltage. 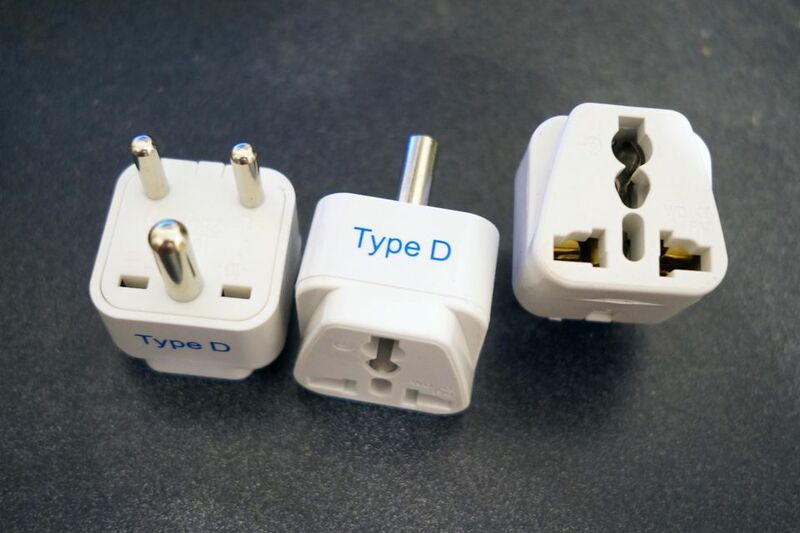 People coming from countries with 220-240 volt electricity (such as Australia, Europe, and the UK) only require a plug adapter for their appliances. Why is the Voltage in the US Different? Most households in the US actually do directly get 220 volts of electricity. It's used for large immovable appliances such as stoves and clothes dryers, but is split off into 110 volts for small appliances. When electricity was first supplied in the US the late 1880s, it was direct current (DC). This system, whereby the current only flows in one direction, was developed by Thomas Edison (who invented the light bulb). 110 volts was chosen, as this is what he was able to get a light bulb to work best on. However, the problem with direct current was that it couldn't be easily transmitted over long distances. The voltage would drop, and direct current isn't easily converted into higher (or lower) voltages. Nikola Tesla subsequently developed a system of alternating current (AC), whereby the direction of the current is reversed a certain number of times or Hertz cycles per second. It could be easily and reliably transmitted over long distances by using a transformer to step the voltage up and then reduce it at the end for consumer use. 60 Hertz per second was determined to be the most effective frequency. 110 volts was retained as the standard voltage, as it was also believed at the time to be safer. The voltage in Europe was the same as the US until the 1950s. Shortly after World War II, it was switched to 240 volts to make distribution more efficient. The US wanted to make the change too, but it was considered to be too costly for people to replace their appliances (unlike in Europe, most households in the US had a number of significant electrical appliances by then). Since India acquired its electricity technology from the British, 220 volts is used. What Will Happen if You Try to Use Your US Appliances in India? Generally, if the appliance is designed to run only on 110 volts, the higher voltage will cause it to quickly draw too much current, blow a fuse and burn out. These days, many travel devices such as laptop, camera and cell phone chargers can operate on dual voltage. Check to see if the input voltage states something like 110-220 V or 110-240 V. If it does, this indicates dual voltage. Although most devices adjust the voltage automatically, do be aware that you may need to switch the mode to 220 volts. What about the frequency? This is less important, as most modern electrical appliances and devices are not affected by the difference. The motor of an appliance made for 60 Hertz will run slightly slower on 50 Hertz, that's all. If you wish to use a basic electrical appliance such as an iron or shaver, which is not dual voltage, for a short amount of time then a voltage converter will decrease the electricity down from 220 volts to the 110 volts accepted by the appliance. Use a converter with a wattage output that's higher than the wattage of your appliance (wattage is the amount of power it consumes). This Bestek Power Converter is recommended. However, it's not sufficient for heat-generating appliances such as hair dryers, straighteners, or curling irons. These items will require a heavy duty converter. For long-term use of appliances that have electrical circuitry (such as computers and and televisions), a voltage transformer such as this one is required. It will also depend on the wattage of the appliance. Devices that run on dual voltage will have a built-in transformer or converter, and will only need a plug adapter for India. Plug adapters don't convert electricity but allow the appliance to be plugged into the electricity outlet on the wall.